Library Technology Services, located on the 4000 level of Booth Library, provides a variety of resources to the Eastern Illinois University community. Our facility includes Booth's Media Collection, the Reserve Media Collection, computer labs, an electronic classroom, audiovisual equipment, three private media listening rooms with surround sound, two Yamaha Clavinovas, and eleven private group study rooms. If you have any questions, please contact one of the Library Technology Services staff. Software: Available software varies by computer location. Please check our software list to see which programs are available. Hours: Computer Lab's hours of operation are the same as Booth Library's hours. Access: Computers are open to the public and no login is required to use them. Computers are available on a first come, first served basis and cannot be reserved. Printing: Black and white copies are 8 cents per page and color copies are 16 cents per page. An EIU Panther Card is required to use the self-service printing stations. Printing charges are billed to the EIU Student Account at the end of each month. People without a Panther Card can purchase a print card for $1.00 at the LTS service desk. Print cards have 10 punches. Black and white is one punch per page, color is two punches per page. Wireless Internet: Wireless is provided throughout the building. Students, faculty, and staff are required to periodically log in to use the wireless. Guest users must self-register to get a guest ID and password to be used for all future wireless sessions. The glass-enclosed computer lab features 58 computers, three black and white printers, and one color printer. All computers are capable of running either Windows 7 and Mac OSX-- simply restart the computer and choose the operating system you prefer. Both Mac and Windows have the latest software, including Microsoft Office and Adobe Creative Suite. Please check our software list to see all available programs. 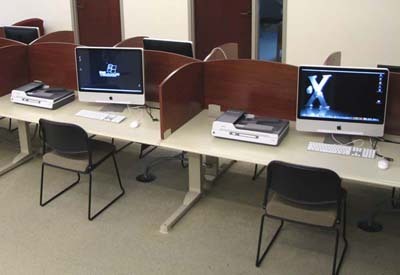 An eleven station media lab is located outside the glass walls of the main lab. Media Lab Plus provides facilities for flatbed or auto feed scanning, photographic slide scanning, and DVD/CD recording. Apple Superdives can be checked out from the LTS desk for use on stations without a built-in DVD/CD burner. The lab also has a station equipped with an LP turntable and cassette tape desk for analog to digital conversion of audio recordings. The Media Lab Plus features specialty software not available in other locations in the library. This includes productivity software for people with special learning styles and advanced mathematics software. 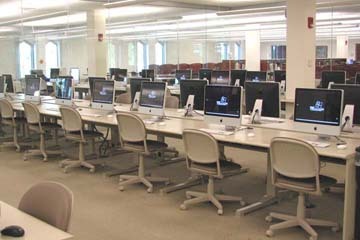 Booth Library has additional general use computers scattered throughout the library along the east side of the 1000 south, 2000 south, and 3000 south levels. Print jobs sent from these computers will go to the print stations on the 4000 level. 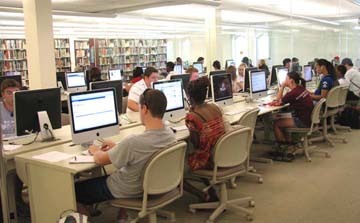 Booth Library has an electronic classroom with 24 student computers on the 4000 level. When the room is not scheduled for classes it is used as an extra open lab for students. 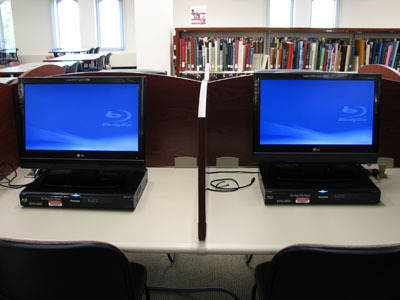 Library Technology Services has public Blu-Ray, DVD, VHS, CD, and cassette players. Headphones for use at individual viewing stations can be checked out form the LTS Service Desk. In addition to the individual stations, there are three private Media Listening and Viewing Rooms, each with a 42" HD Plasma screen setup for Blu-Ray, DVD, or VHS media. These media rooms are equipped with Dolby SurroundSound Systems. Check at the LTS service desk to see if this room is available for your group of up to six people to view a movie. Eleven group study rooms of various sizes are located on the 4000 level. These rooms are available on a first come, first served basis and cannot be reserved. All rooms have a white board and tables equipped with electrical outlets and network ports. Two rooms feature a 27" monitor that can be connected to a laptop or other mobile device. Typewriters are located on the tables near the windows on the east side of the 4000 level. Two group study rooms have Yamaha Clavinovas for keyboard rehearsal. 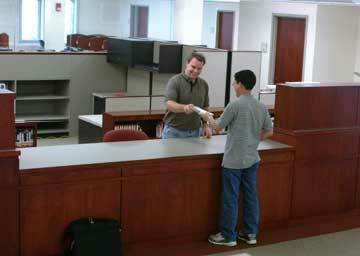 A large paper cutter and several paper hole punches are located on the counter behind the LTS Service Desk. Laminating, up to 8.5"x11", is available. Overhead transparencies can also be printed. Ask at the LTS Service Desk for details. This collection includes sound recordings, videotapes, DVDs, and CD-ROMS. As described in the Circulation Policy, sound recordings are available to Eastern patrons for one week. DVDs and videos circulate for 2 weeks to faculty and three days to students and staff. You may search for movies and music in the EIU Online Catalog, or come into the library and browse the shelves. Faculty may have videos delivered to their department office by filling out our Online Reservation Form. If a non-print item needs to be accessed by a number of students, faculty may place it on reserve in Library Technology Services, where it will be circulated on a limited charge-out basis. Media reserve requests can be placed using the media reserve request form.